If you’re new to GFE VSG, the goal is to share information from my actual support group meetings with all of you. That includes information on the presentations, the food shared, tips from my members … anything that comes out of the meeting that I think you will find helpful. Sometimes I’ll add additional pertinent information to my GFE VSG post that we might not have had time for in our actual meeting (those fly by so quickly!) or that I investigated further later. In return, I’d like you to interact with all of us participating virtually by commenting on the presentations, gluten-free recipes, and all info and sharing your own input. There will be a linky, as you can see at the very bottom of this post, so if you are a blogger, please link up your recipe that fits the monthly theme. 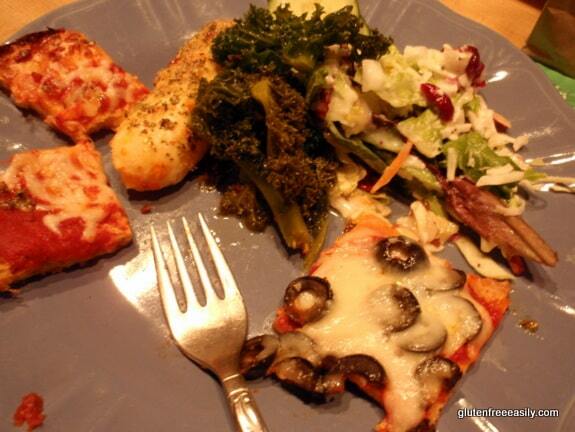 This month’s theme is pizza and greens (green vegetable dishes, salads, green appetizers, etc.). See the participation guidelines further down right before the linky. Finally, there will also be a giveaway each month! Giveaways will tie into the topic of the meeting and/or the food theme. You do not have to participate in the linky to enter the giveaway. Anyone who leaves a comment will be entered for the giveaway. Only one comment is required (and only one will be counted), but folks are welcomed and encouraged to have discussions in comments. Carey has both Crohn’s and celiac disease and has been eating gluten free for several years. Two of her three children also have celiac, and while the third tested negative, he also has symptoms of gluten issues. Carey told her own story of years of misdiagnoses, including the ubiquitous Irritable Bowel Syndrome (IBS) diagnosis that she was given based on symptoms alone, without any testing. (At this point in her story, I had to tell her that many of us who received an IBS diagnosis before finding out about our celiac/non-celiac gluten sensitivity say that the doctor is saying “I Be Stupid” or we say “It’s BS” as an IBS diagnosis is a “catch-all” based on a collection of symptoms rather than a true diagnosis.) It was after several friends and family members of Carey’s were diagnosed with colon cancer, and one was lost to the disease, that she became very concerned about her own ongoing symptoms and insisted upon further testing. Initially, testing revealed that she had Crohn’s disease, but later after continued symptoms/issues, she was diagnosed with celiac disease as well. Carey stated that her current gastroenterologist believes that her Crohn’s damage was more extensive due to years of undiagnosed celiac disease and, therefore, continued gluten ingestion. Recently, Carey was diagnosed as lactose intolerant, so she is eating both gluten free and dairy free now. 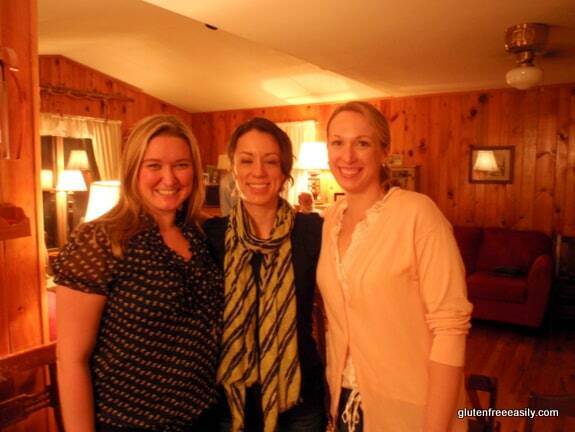 Her story also includes the amazing support of her dear, long-time friends Jen and Heather. Inner Circle Foods was “born” when Carey and Jenn were attending a food expo type event and Carey wistfully mused how wonderful it would be to be able to safely eat and enjoy any food there; i.e, to have all the food be gluten free. The two of them talking out loud and pondering the possibilities then, and later with Heather, quickly turned into a business endeavor for all three friends—namely Inner Circle Foods! So Lucky Gifts is their first foray into gluten-free offerings—gift boxes of gluten-free foods and “accessories” (e.g., a tea gift package comes with the tea cups) all lovingly packaged and delivered to one’s door. Inner Circle Foods hopes to have a gluten-free grocery store up and running in Manassas by the end of the year. 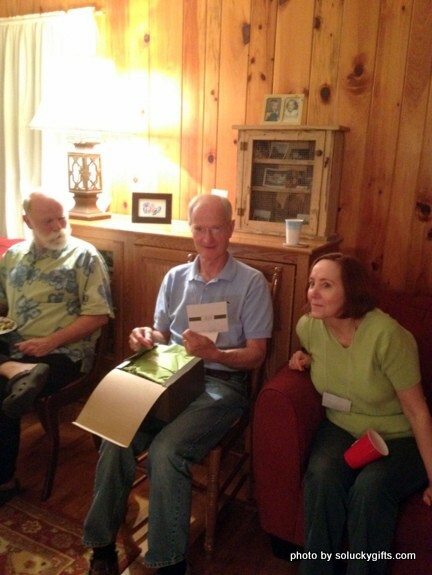 They donated a So Lucky Gifts door prize to our meeting and the winner was quite pleased! They also brought one of their college gift boxes for Son–the So Smart College Box Gluten Free, Dairy Free— which he got to open a few days after the event. He really loved his special package. His favorite item was the container of organic lollipops, but he didn’t turn up his nose at any of the contents. He was quite tickled to have this gift to open when he arrived home! Had he not been coming home, it would have been shipped directly to him at college and I know he would have loved that special surprise, too. The ladies at So Lucky Gifts also brought some of the products that they include in their gift packages to our meeting. First, they shared Chebe Garlic Onion Breadsticks, which they served with Tuscan Farmhouse Herb Dip … all shown in their gift package here. 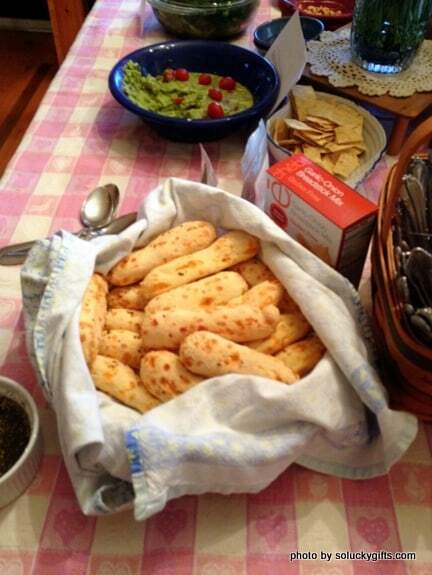 We all really enjoyed these breadsticks as an appetizer while we waited on the pizzas to be done! Then at the end of their presentation, they brought out some of their Suss Vanilla Caramels with Sea Salt. These candies were outstanding! 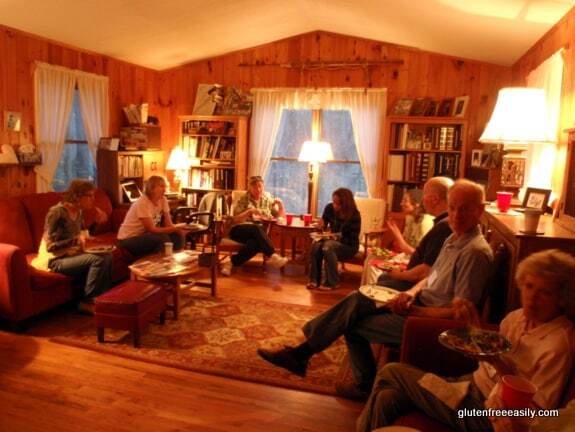 Those mentions naturally lead to the entire listing of food we enjoyed at our meeting, but before we get to that, I’d like to take a few minutes to chat about gluten-free college students, and their caring and concerned parents. For those who are gluten free, attending college can bring both challenges and opportunities. First, is the decision on deciding which college to attend with gluten-free dining and academic, extracurricular, and numerous other concerns at the forefront of the decision-making process. Admittedly, we didn’t go through this experience. 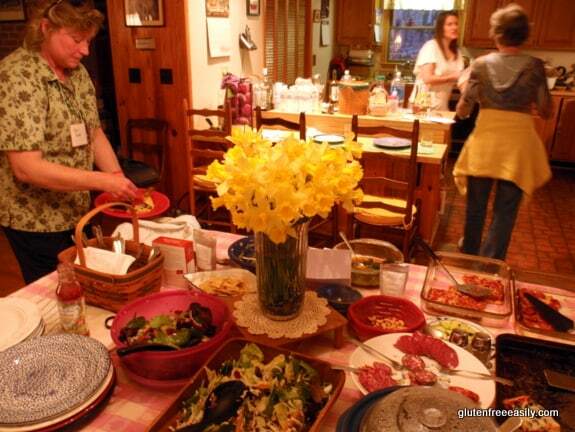 When Son went off to college, he was not eating gluten free, but once he went 100% gluten free almost 2 years later, college dining became much more complicated. Make that near impossible. In fact, I know he would have done backflips if he’d found one of So Lucky Gifts packages on his doorstep at that time! Instead I made lots of trips to visit him with full grocery bags and cookie tins in hand, plus while I was there we often made trips to the grocery store and almost always ate out where we could eat real food, quality food, and naturally gluten-free food. Living off campus in an apartment the last few years and eating gluten free, dairy free, soy free, and “more free” of late, he’s done his own shopping and cooked most of his own food with occasional meals out at a few favorite, “safe” restaurants. Her NFCA series on Gluten-Free College Dining Hall Challenges—This series offers the parent’s and the student’s experience for the first semester of college. It’s both a high-level and an in-depth look at those “challenges.” That means that it’s not pages to wade through, but enough to save you from similar challenges. And did I mention that Wendy had both a son and daughter in college at the same time? Bottom line: You get a really good feel for the challenges you and your college student could be facing in this series. NFCA’s College Blogger Series—Who can we better learn from than the gluten-free students themselves? Gluten-free college bloggers give you somewhat diverse, “up-close-and-personal,” ongoing perspective on living gluten free at the particular college they attend, plus so many of these experiences and challenges can be applied to any school situation. Gluten-Free Travel Site’s College Reviews Page—These are what I call “quick and dirty” reviews, and only a small number of schools are addressed in these reviews right now. (If you have gluten-free insight on any college, please add your review to help others.) Most of these reviews are written by students and parents and give an overview of the gluten-free dining options, but one as written by a gluten-free person who seemingly only had a telephone interview with the Dining Hall Services director. The latter assessment is woefully insufficient; I refer you back to Wendy’s NFCA series as proof of that. But this page is a help to folks and will only improve as more folks learn about it and add their experiences. Wendy’s daughter, Shelby Kaho, is one of the gluten-free college students in her family. Wendy talks about Shelby’s experiences and her gluten-free advocacy some in her NFCA series, but Shelby has quickly become a “sought after” gluten-free spokesperson. Check out her guest post at Go Dairy Free: Dorm Survival Guide for Students with Food Allergies or Sensitivities; her articles on Diets in Review, such as Advocating for Gluten-Free Diets in College; and her own blog, One Hurdle at a Time. Shelby’s most recent blog post offers excellent advice on “fitting in” while staying gluten free. She and other gluten-free bloggers are putting their expertise to use to help others and expand their business skills at the same time; read more here. And as the old saying goes, Shelby doesn’t “let any grass grow under her feet”—literally in this case, read Pete Bronski’s profile of her in his Athlete Insight series. 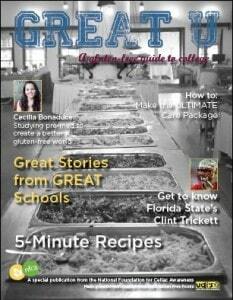 Shelby is also introduced in a two-page spread in NFCA’s brand-new college magazine, GREAT U, A Gluten-Free Guide to College. This new publication is interactive and impressive. The article on Shelby is such a great highlight of this positive young woman and her achievements and, again, what an excellent resource this new magazine (sponsored by Udi’s Gluten-Free Foods) truly is! Clearly, there’s much headway being made in serving gluten-free college students (and therefore their parents, too) right now. And to come full circle (Inner Circle? ), Wendy has written about the So Lucky Gifts College Care package that Shelby received here. Food: As far as our main meal, we had so many pizzas (like Flourless Pizza—one plain cheese and one pepperoni; Grain-Free, Dairy-Free Flatbread Pizzas; Olive and Mozzarella Pizza; Gluten-Free, Dairy-Free Pesto Pizza; and more) that there was actually some pizza left over at the end of the night! That is a very rare occurrence, but I think that had to as much to do with the number of pizzas as with all of the greens and other foods we had to share. There was cooked kale, broccoli, cucumbers, zucchini, and wonderful salads like Strawberry Salad (that featured cabbage and other greens with strawberry dressing) and Great Salad. There was homemade guacamole (Karina’s Easy Guacamole with Lime) with tortilla strips and Columbus Salami to sample while we waited on the pizzas to be ready. 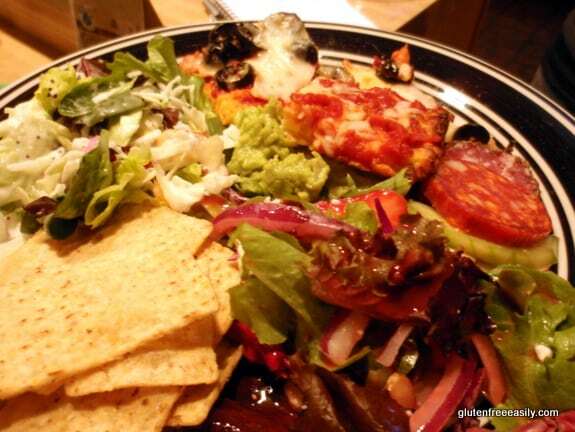 (In fact, the guacamole bowl was empty by the time the pizzas came out of the oven and the salami was half gone even though I’d only remembered it right before serving the pizzas.) 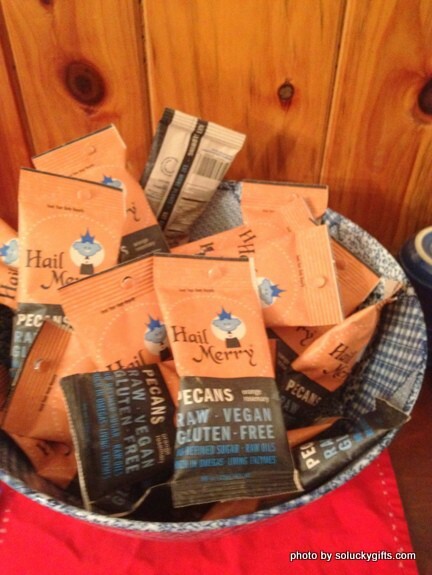 We also enjoyed some Hail Merry snacks—Orange Rosemary Pecans. These received high praise from all! Desserts were few but more than adequate; there were some tasty Schar Shortbread Cookies and Aleia’s Chocolate Chip Cookies, and delicious homemade Grain-Free Apple Custard Pie. We enjoyed iced tea, club soda, wine, and more. 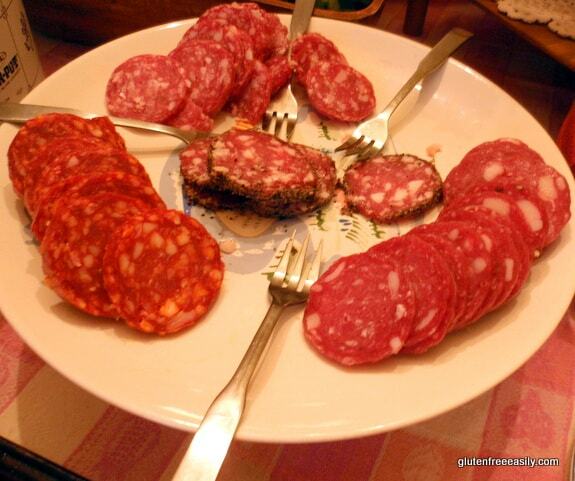 We always enjoy the most wonderful gluten-free food at our meetings. As you can see most of our food is real food, that’s naturally gluten free, and recipes made from that real food. Many of our dishes are dairy free, refined sugar free, etc. as well. Members either bring copies of their recipes to have alongside their dish to show its ingredients or they note the ingredients on index cards to ensure that all eat safely. Update: This giveaway is now closed. Congrats to the following winners, and thanks to everyone who joined in for this month’s GFE Virtual Gluten-Free Support Group! ~ So Lucky Gifts – donated by So Lucky Gifts. There will be two winners; each will receive a So Lucky Gifts package. One winner will win the gift package, So You Like Breadsticks, which contains three of the Chebe Breadstick Mixes shown in the photo below. Another winner will receive the gift package So Smart College Snack Size, also shown. 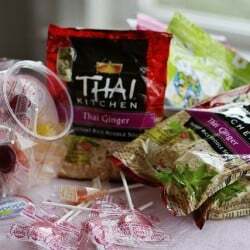 This package contains the Yummy Earth Organic Personal Lollipop Bin that Son so appreciated, plus Honey Stinger Organic Energy Chews, and Thai Kitchen Noodles (like Ramen, but gluten free, of course). 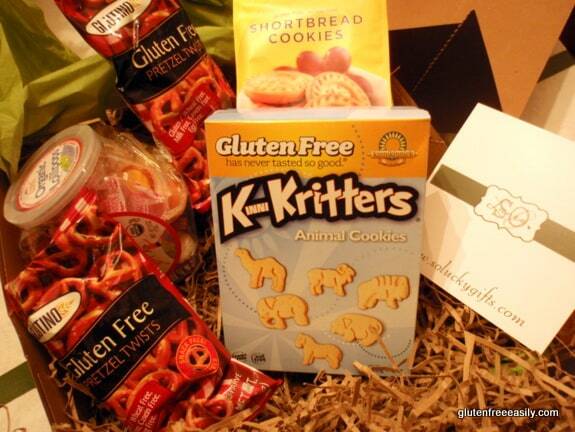 Of course, you don’t have to be a college student to enjoy this package, but if there’s a gluten-free college student in your life, if you win, the package could be shipped directly to them. ~ Link up a recipe you made and posted that contains real food ingredients that fits this month’s food theme, Pizza and Greens. Older posts may be used as long as they follow all the other rules. ~ Link to only one recipe in each category. One pizza recipe. One green recipe (green veggie dish, green appetizer, green salad, etc.). ~ Do not link to advertisement or business blogs. 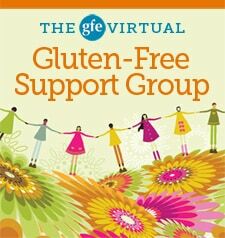 ~ Ensure that you mention The GFE Virtual Gluten Free Support Group in your post and link back to this post so your readers will check out all the info and recipes. ~ Leave a comment on the post. A comment is required if you are linking up a recipe or entering the giveaway. ~ Links will be removed if guidelines are not met (e.g., no link back to this event, no recipe is included in the post, the link goes to an advertisement or business blog). ~ This linky will close on Wednesday, April 11, at midnight Eastern. The giveaway will end at that same time. This post is linked to Allergen-Free Wednesdays and Gluten-Free Wednesdays. How funny that you should post this today! Just earlier I was trying to figure out how to use of a bunch of “pizza fixin’s” I have in the ‘frig. I Googled up a recipe that uses shredded zucchini and eggs to make the crust that I’ve bookmarked for later. Since I don’t have zucchini, I reasoned that I could do something very similar with potatoes, which I’ll experiment with tonight. Also, if you have not tried them, I cannot recommend Venice Bakery’s seasoned individual pizza crusts enough. They’re hearty enough to stand up to whatever (and how much/many) toppings you want to put on and they stay crisp. But the real “biggie” for me was that they still taste good after they cool some. Bob’s Red Mill tastes just fine when it’s piping hot out of the oven, but let it cool even a little and it IMHO gets yucky. These crusts didn’t AND I had some leftovers that I covered and reheated in the oven the next day. They were still as tasty and didn’t turn gummy or limp. No, I’m no shill for them (promise), but when I find something that tasty (and I am one picky person) I have to share! First, a early congratulations to your son (and you)! So awesome! What a great accomplishment. Great links and resources too! So wish I could attend your meetings. But thank you for giving us this great post, it’s really the next best thing. Thank you for sharing Carey’s story. It’s miserable to go misdiagnosed. So glad she has found her healing journey! She sounds like a fighter. Just so much great information on here Shirley. 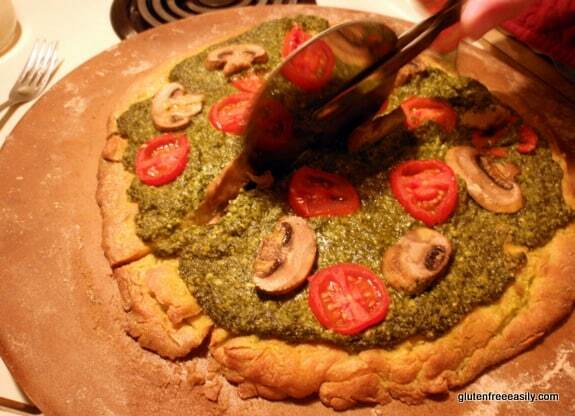 I love the idea of a pesto pizza. I think I’ll have to tinker with a grain-free, dairy-free crust and topping. I missed last month’s meeting so I’m happy to be joining in this month. Thanks. I can’t imagine having to live GF during college – I survived on cereal and pizza during my college years (of course, I was so, so sick, too, since it was before my diagnosis but after symptom onset…). I really don’t know what I would have done if I had to be gf or df in college. I know I would have figured out a way and that my aunties and uncles would have helped any way they could, but navigating the locals foods back home just our last visit was difficult. Next week, I am going prepared with having my own condo just around the corner from my grandparent’s home to fix my own food in if needed. I’m sure the older family members will be tired of my, “What is in it?” questions since I’ve been eating the food my whole life and they are the family members unaware of my food issues. I am confident that I will be a-okay! Congratulations to Son a little early! Thank you for hosting another fabulous event! What a great resource for all of the GF people out there. 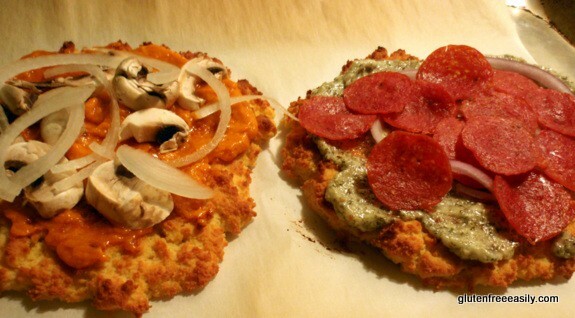 I linked up my cauliflower crust pizza and what better to go with pizza than pasta?! I linked up my grain-free “pasta” that is full of green veggies – peas, asparagus, and zucchini! Congratulations to your son! Mine is 19 months and I can’t even imagine him graduating yet! The support group sound like a great idea. i think i need a vegan support group around here. those are some great options for surviving through college. What great resources this meeting offered! I would have brought a cauliflower, mozzarella cheese (goat)and egg crust pizza. I made it last night for dinner, thinking I’d missed the virtual mtg. I used left over broiled asparagus, sliced diagonally, and sheep cheese finely shredded over the top. Leftovers for lunch. I got the recipe from my massage therapist, also gf, who found it online @ eat-drink-smile.com. Above, I saw something similar with zucchini. Mmmmmm. I hope to have squash out my ears from my garden this summer. A great way to use it! What a great post! Looks like a great time!! Thanks for sharing it all!! love the food and friends. what a wonderful support group you have created. I’m jealous, but so happy to read about it. thank you! I made your crustless apple pie and posted the recipe and photos on my blog (with a link back to you, of course!) It was fantastic!!!! Hi, I was excited to see that I won the giveaway for the palm sugar!! I would NOT like to win the giveaway for this post i’m commenting on, but I wanted to ask, how will I recieve the palm sugar?!? THANKs!! Hi Grace–I planned to send an email to all winners, but I’ve been caught up in other stuff and away today. If you would send me an email here with your name and mailing address, that would be terrific. 🙂 Many, many congrats on winning the palm sugar giveaway! Wow, you never cease to amaze me. This post is packed with information, great resources, and interesting tid-bits. You are such a good support leader, whether in real time or virtually! I love catching up with what’s going on in your GF world via these updates. 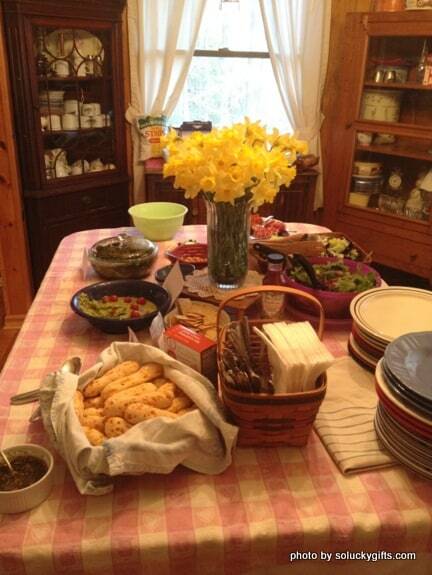 Plus, your house looks SO inviting with the flowers, food, and give-away treats. Thanks for inviting your far-away friends into your home! Thank you for another virtual support group meeting, Shirley. I am loving getting to see pics of your beautiful home! Thank you for the giveaways. Awesome post! Looks like you have a great group there. A lot has changed in the gluten free world since I was diagnosed while in college in 1996! There were no options back then. They wouldn’t even let me out of my meal plan contract even though I couldn’t eat any of the food anymore. So I ate a lot of salads, ice cream and my roommates and I stole a lot of fruit to hoard for later. Luckily my mom and grandma were only 1.25 hrs away and we met to do the food swap frequently. I did have a car so I could go get food and stash it in my dorm room when needed. And it also helped that my roommate was dating our RA (secretly), so he never said anything about my ‘illegal’ toaster that I kept in our room for my (nasty!) bread. 🙂 I survived, but it wasn’t pretty! And thanks for the Linky! Thank you for responding. I clicked on the link to send you my info. and it was blank,I couldn’t send it anywhere or type. Is there another way to do it? Thanks again for the giveaway! I was craving pizza tonight! We ended up ordering from Donato’s and I got the no-dough pizza with chicken and spinach. I’ve got to remember to lay off the cheese though, no gluten but I’ve still got a tummy ache 🙁 Next week I’m going to try making personal pizzas out of the Chebe breadstick mix! It looks like you had a great meeting. I’m linking up a very old recipe that is a combination of your pizza and green theme–zucchini crust pizza. Since you launched the support group last month, I am already looking forward to this great event every month! I shared my Creamy Kale Salad recipe today. Have a wonderful Easter weekend! I added my kale pesto–greens, and goes well on a pizza. I agree that Wendy is a rock star and has done so much for the GF community! Please don’t enter me in any of the give aways. 🙂 Shirley, your events are so great! How I wish I lived close enough to attend one in real life. That being said, I made the spinach, kale and dandelion green salad in anticipation of this event…I do believe the savory-sweet dressing would go perfectly with any of those lovely pizzas you all enjoyed. Another great post! Something is wonky with the link up…it says I don;t have a backlink, but I do. I will try again later! Good meeting Shirley! Wish I was closer to taste all those wonderful looking foods. Oooh, that pesto pizza is calling my name! That is one of my favorite kinds. Wow! 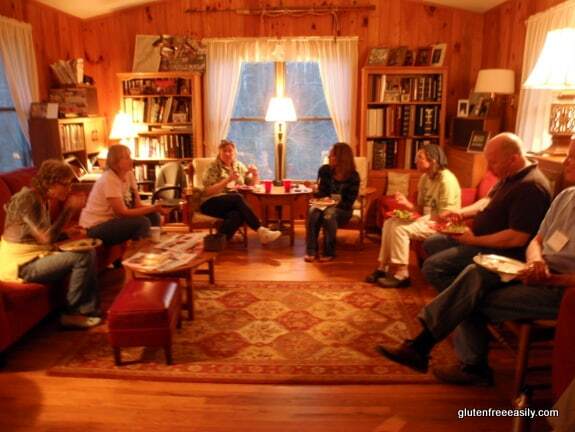 Your gluten free support group looks like a good time with great speakers. I wish there were such a thing in my area. I can attest to how amazing the meetings are at Shirley’s! I drive 50 miles to get there! I don’t make it every month. Wonderful group of people. Would love to win one of those cookbooks! The pizzas on this post look amazing! Your son’s about done with college, but mine is about to go! The links for all the college students are right on time for me. Thanks again! I can’t get the linky to work either Shirley. Tried last night and this morning. The pizzas at your meeting look fabulous. I have a weakness for pizza. You guys have the coolest group — with such good food and also helpful information. Kudos to you for all you do! Another great VSG! I love all the information, thank you so much for putting this together for us, though it does make me wish I lived a little closer to be able to attend a real person meeting 😉 I don’t have a blog, but I would definitely have made a field green salad with marinated roasted veggies and avocado with a balsamic dressing. I cannot eat the pizza, but am drooling over them! Loved all your ideas for fixings! Thank you Shirley! Mmm! 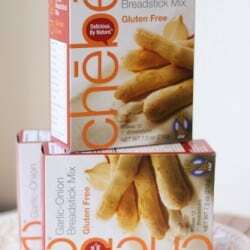 Gluten Free Breadsticks, I would LoVe some! PLEAZE??? 😉 Thank you for the great article too! 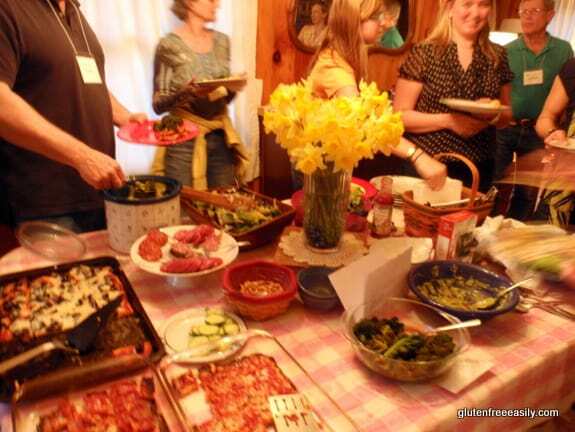 I attended a gluten-free Sedar recently and the gluten-free matzo was a big hit! I’ve heard a lot of good things regarding Chebe products. Would love to try out the breadsticks! love this, the cookbook would help me alot. was just diagnosed last month with celiac and been suffering symptoms for 2 years. I think I have had celiac diseae my whole life, I just found out that I had it on my 54th birthday, I have had my uterus and thyroid removed due to disease I think were caused by celiac disease, now that I am gluten free I feel so much better. Hey, what a great meeting! Thank you so much for doing this for all of us. I so appreciate all the information. I would bring a Red Pepper, Sesame Kale Salad. It’s one of my faves. Thanks Shirley AND heather!, i am so excited for my gift basket! WOOT WOOT!! Lucky day…. Yay I won! How exciting! Looking forward to receiving the gift basket!